Midwest Horse Fair | ARIAT Jumping with the Stars! ARIAT Jumping with the Stars! Ariat Jumping with the Stars! at the Midwest Horse Fair. Madison's beloved 3-time Olympian, Suzy Favor Hamilton. The first ever Ariat Jumping with the Stars! 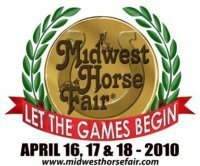 is coming to the Midwest Horse Fair on Sunday, April 18 at around 12:30 PM. We have five celebrity, beginner riders. They have been paired with Wisconsin hunter/jumper trainers. They have from now until April 18th to learn to walk, trot and canter and jump a course of fences and demonstrate their abilities. A panel of judges, all seasoned horse professionals, will comment on the celebrity rides and score the teams. Audience members will have the opportunity to sign on to an SMS service to add their text vote on their cell phones. The winning trainer/celebrity team will walk away with a trophy, an Arc de Triomphe bridle, other prizes, and bragging rights. Kidd O'Shea from Kidd and Elizabeth in the Morning" on 99.1 WMYX Milwaukee. We have an incredible roster of competitors! Your host for all the fun is horse enthusiast, George Mallet from Today’s TMJ4 in Milwaukee. 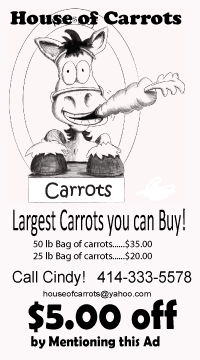 Madison’s own Olympic runner, Suzy Favor Hamilton will train with Pamela Prince from Meinpferde Farm, Connie Kelly from the Connie and Fish morning show on WZEE-FM (104.1) and The Brew (97.3) in Milwaukee will train with Kate Bomgaars Reuter (who, by the way, will ride in the $40,000 Nutrena Grand Prix on Saturday night), evening anchor, Leigh Mills from WMTV NBC 15 in Madison is paired with Stephanie Veloff Histed from Timeless Farm. Kidd O’ Shea is the go anywhere, do anything co-host of Kidd and Elizabeth in the Morning on 99.1 WMYX Milwaukee. He will train with Kathleen Caya from Cheska Farm in Waukesha. John Flint from the John and Tammy Show on 96.2 Star Country will head over to the Hoofer Equestrian Center to train with Andrea Bill. Leigh Mills from NBC 15 in Madison. The event benefits American Family Children’s Hospital, a comprehensive pediatric medical and surgical center featuring nationally recognized pediatric specialists in fields from cardiology to cancer. Opened in 2007 and located in Madison, Wisconsin, the state-of-the-art facility continues to win widespread praise for the warm, soothing atmosphere that enhances a child’s ability to heal. Check by often. We’ll be chronicling all the fun leading up to the event!